WASHINGTON (AP) — The chairman of the House Judiciary Committee suggested on Wednesday that former Acting Attorney General Matthew Whitaker may have had conversations with President Donald Trump about Michael Cohen’s legal troubles, saying that Whitaker “did not deny” the conversations during a private meeting on Capitol Hill. Rep. Jerrold Nadler, D-N.Y., did not get into the specifics of what Whitaker said when he met with Nadler and the top Republican on the panel, Georgia Rep. Doug Collins. Collins said he heard Whitaker’s comments differently and maintained that Whitaker said he “had not talked with the president about Mr. Cohen at all.” Two Republican staff members in the room backed up Collins’ version. The aides spoke on condition of anonymity to discuss the confidential meeting. There was no transcript taken at the meeting, according to the Republican aides, so it wasn’t clear exactly what Whitaker said, and it may never be clear. But the dispute could have high stakes, as Democrats have voiced concerns that Whitaker was a Trump loyalist whose appointment, they suspect, was aimed at suppressing investigations of the Republican president. Whitaker returned to Capitol Hill on Wednesday after Democrats said they wanted him to clarify his open testimony before the Judiciary panel in February. One thing that Nadler said he had questions about was whether Trump had “lashed out” at Whitaker after Cohen, Trump’s former personal lawyer, pleaded guilty to campaign finance violations and lying to Congress. News reports said Trump did lash out at Whitaker, but Whitaker said in the hearing that he did not. In a letter to Whitaker asking for him to return and clarify his comments, Nadler said that the committee “has identified several individuals with direct knowledge of the phone calls you denied receiving” from the White House. Nadler also said after the meeting that Whitaker was “directly involved” in conversations about whether to fire “one or more” U.S. attorneys — he did not say which ones — and that he was “involved in conversations” about the Southern District of New York’s case against Cohen and whether it might have gone too far. Nadler did not give details on those conversations. Collins said that Whitaker suggested the conversations about district attorneys were normal personnel issues, and to characterize those comments otherwise were “an overreach and a stretch.” Collins added that Whitaker said he hadn’t had any conversations with officials in the Southern District of New York. According to the Republican aides, Whitaker said that those conversations were among other Justice Department staff and that Whitaker said he thought some of the claims in the campaign finance case were “specious” from a legal standpoint. At the February hearing, which was held while Whitaker was still acting attorney general, Democrats confronted him on his past criticism of special counsel Robert Mueller’s work and his refusal to recuse himself from overseeing it, attacked him over his prior business dealings and challenged his credentials as the country’s chief law enforcement officer. Nadler said after the public testimony that his answers were “unsatisfactory, incomplete or contradicted by other evidence.” In the letter sent to the Justice Department, Nadler said Whitaker didn’t offer clear responses about his communications with the White House and was inconsistent about what questions he refused to answer. 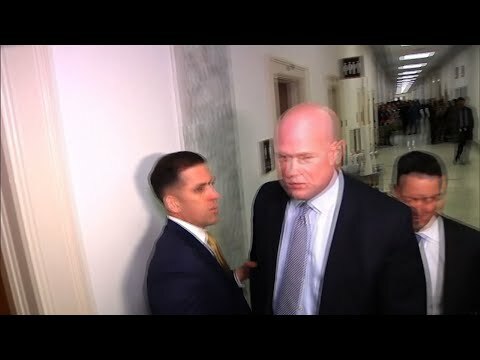 Whitaker left the Justice Department after Attorney General William Barr was confirmed Feb. 14.